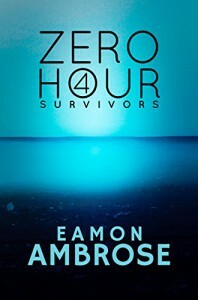 Zero Hour Part 4: Survivors by Eamon Ambrose is a futuristic, dystopian short story which starts where Part 3 stopped. It is action-packed and a crazy post-apocalyptic world. I gave it five stars. "Halfway there, I realize I'm too late. Murphy looks up, frozen in terror, and covers his head with his arms hopelessly to shield himself as a huge Nemesis drone the size of a car falls from the sky, crushing him. The sound he makes as it hits him will never leave me. I can't even describe it. Never in all the years of fighting have I seen someone die like this." The survivors think that Captain Sarah Ford was killed in action. The unnamed narrator is disrespected by Davis who has a few supporters. At a meeting, the narrator finally decks Davis with one solid punch. His cronies pick up his limp body and drag him outside. Then they steal the truck with all the supplies and disable the other truck. The group had just voted unanimously to kill Davis when he and the others escaped. I can hardly wait to read Part 5, Countdown.